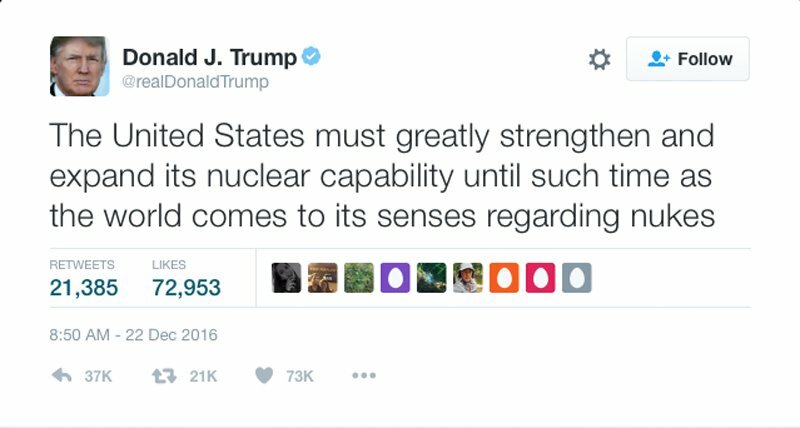 President-elect Donald Trump tweeted in December that the United States “must greatly strengthen and expand its nuclear capability” and later told a television host that he would “outmatch” and “outlast” other potential competitors in a nuclear arms race. Increasing the arsenal would constitute a fundamental departure from U.S. policy and could prompt similar efforts by other nuclear-armed countries. Since the end of the Cold War, the United States has reduced the size of its arsenal, including through arms control agreements with Russia, from roughly 19,000 operational warheads in 1991 to 4,571 as of September 2015, according to U.S. government figures. The United States has begun a program to sustain and upgrade the arsenal at a cost that could reach and possibly exceed $1 trillion over the next 30 years. It is unclear what Trump has in mind, as aides offered interpretations seemingly at odds with his words. Jason Miller, at the time a top spokesman for the Trump transition, said in a statement later that day that the president-elect was referring to “the threat of nuclear proliferation and the critical need to prevent it, particularly to and among terrorist organizations and unstable and rogue regimes.” During the campaign, Trump had “emphasized the need to improve and modernize [the U.S.] deterrent capability as a vital way to pursue peace through strength,” he added. Trump’s statements prompted varied reactions from Russia and China. Putin added that the United States had already “paved the way to a new arms race by withdrawing from the  Anti-Ballistic Missile Treaty” and expanding its missile defense capabilities, which prompted Russia to respond by building “efficient means of overcoming this missile defense system and improving its own” offensive nuclear forces. But Putin said that Russia “will never be dragged into an arms race to spend more than we can afford,” noting that Russian spending on defense would drop from 4.7 percent of gross domestic product in 2016 to 2.8 percent by 2019. During the election campaign, Trump expressed a desire to improve the U.S. relationship with Russia, but did not say whether he would seek to engage in further bilateral arms control beyond the 2010 New Strategic Arms Reduction Treaty. China is “paying close attention” to Trump’s nuclear pronouncements and declared that the “countries that have the largest nuclear arsenals should bear special responsibility for nuclear disarmament,” said a spokesperson for the Chinese Foreign Ministry. That was a reference to the United States and Russia, which together possess more than 90 percent of the estimated 15,500 nuclear warheads worldwide. Meanwhile, Democratic lawmakers strongly criticized Trump’s tweet and subsequent arms race comments.